May and June days have swiftly and gently drifted away. The early spring flowers have passed, also a great deal of our anticipation. But summer has always something new in store. By July the meridian of the year is reached. The luster of the season begins to dim, the foliage of the tress and woods to tarnish, the plumage of the birds fades and their songs cease. It is here that we vividly recall the words of John Donne - “Summer’s robe grows Dusky, and like an oft-dyed garment shows.” Former Curator Martha Crone. On this web site we mark the transition from early summer to late summer around the 15th of July. All of the plants shown here were blooming in early July. Some will continue their bloom well into late summer. More photos of each plant and additional plant information can be found at the link on the plant name. Alternate common names for plants are listed in ( ). White Prairie Clover (Dalea candida Michx. ex Willd.). Family: Pea. Upland Garden. 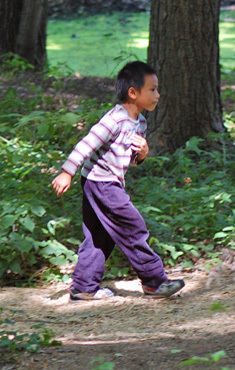 In the wild it is listed on the Minnesota DNR's Special Concern List. The plant is attractive to butterflies and bees, a tea can be made from the taproot that is said to reduce fever. On grazeland is a palatable and nutritious forb. 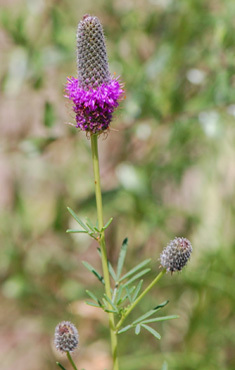 Purple Prairie Clover (Dalea purpurea Vent.). Family: Pea. Upland Garden. Human use is restricted to medicinal uses. It has been reported that a tea made from the taproot will reduce fever in measles victims. Meriwether Lewis reported that bruised leaves were steeped in water and applied to fresh wounds. Purple Bergamot (Monarda media Willd. ).Family: Mint. Upland Garden. 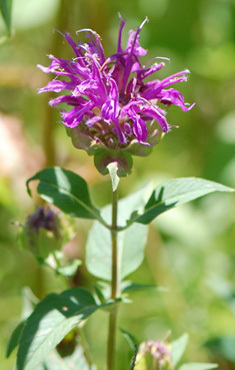 Similar to Wild Bergamot (Monarda fistulosa L.) except in the flower head. This has deeper red-purple flowers than the Wild Bergamot and the bracts under the base of the flower become quite dark at maturity. Wild Bergamot, growing in clumps in the same areas, has lilac to pink flowers with a pink tinge on the flower bracts. A favorite of bees. 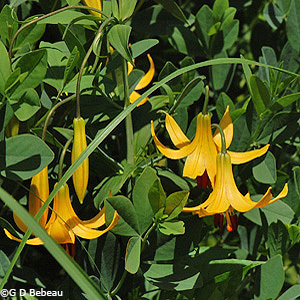 Canada Lily (Lilium canadense L.) aka Meadow Lily or Wild Yellow Lily. Family: Lily. Upland Garden. 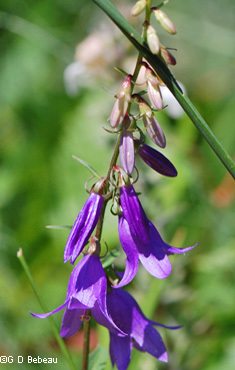 The nodding bell shaped flowers are a marker of this plant. 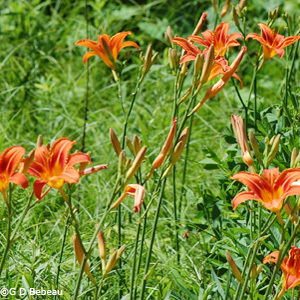 Orange Day Lily (Hemerocallis fulva L.). Family: Day Lily. Upland Garden. Naturalizes with ease. Beautiful stands along roadsides in Minnesota and in home gardens. Virgin's Bower (Clematis virginiana L.). Family: Buttercup. Upland Garden. A vine plant. You will usually spot the white flowers lying atop the leaves of other plants before you see the stem. Occurs generally in Minnesota. Can be trained to grow on a trellis in the home garden. 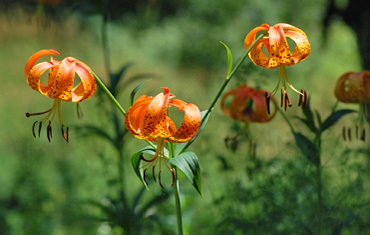 Turk's-cap Lilies (Lilium superbum L. and Lilium michiganense L.). Family: Lily. Upland Garden. Rising on a tall stem above a whorl of leaves, these plants are hard to miss. Becoming uncommon in the wild due to cultivation and roadside mowing. 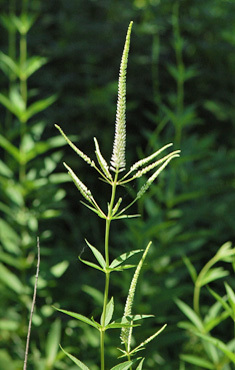 Culver's Root (Veronicastrum virginicum (L.) Farw.). Family: Figwort. Upland Garden in several places. On all but the most immature plants there will be smaller flower spikes under the larger center spike, all rising above whorls of leaves. 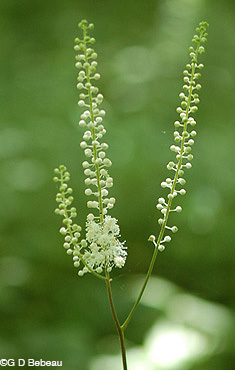 Black Bugbane (Actaea racemosa L. var. racemosa). Family: Buttercup. Woodland Garden and in transition to the Upland where there is shade. This example by the Avery Birding Terrace. Very tall stems (up to 6 feet), flower racemes well above any leaves. 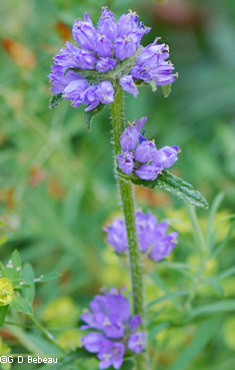 Blue Giant Hyssop (Agastache foeniculum (Pursh) Kuntze). 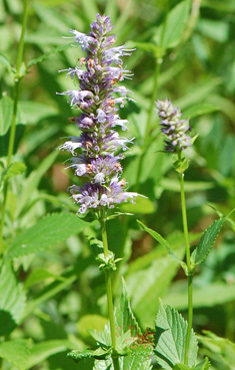 aka Fragrant Giant Hyssop, Anise Hyssop. Family: Mint. Upland Garden. Native to open dry areas of Minnesota. Leaves have an anise odor when crushed, hence the name. 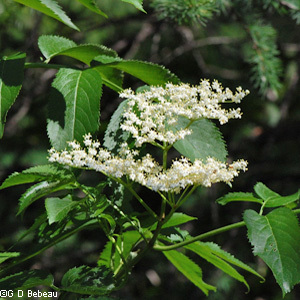 Canada Elderberry (American Black Elderberry) (Sambucus nigra L. ssp. canadensis (L.) R. Bolli). Family: Honeysuckle. Woodland Garden. This large shrub only comes into flower in mid-June and flowers until late July. The first flowers don't occur until the Red Elderberry has already set fruit that is turning red. The fruits are edible after boiling. Virginia Mountain Mint (Pycnanthemum virginianum L.). Family: Mint. Upland Garden. Native to southwestern Minnesota. ID: Notice the purple spots on the white flowers. Foliage is aromatic. Plant can become invasive. 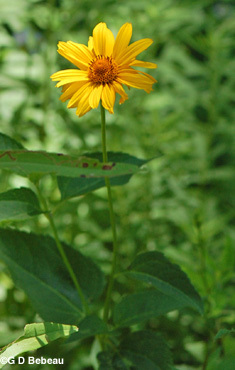 Smooth Oxeye (Heliopsis helianthoides (L) Sweet). Family: Aster. Upland Garden in various places. Stem somewhat rough in this variety. Native to most of Minnesota, the Nursery trade has several varieties for the home garden. 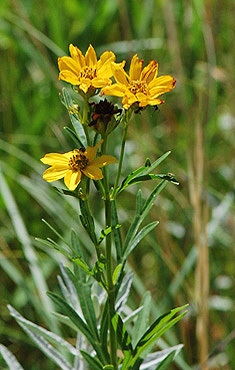 Stiff Tickseed (Coreopsis palmata Nutt.). aka Bird's foot coreopsis and Stiff coreopsis. Family: Aster. Upland Garden, in large areas. Native to southern half of Minnesota. The original Garden plants were acquired in 1927 from NE Minneapolis by Eloise Butler. European Bellflower (Rampion Bellflower) (Campanula rapunculoides L.). Family: Bellflower. Upland Garden. A European import now widely naturalized in Minnesota. The Flowers mostly at the top of the tall stem. 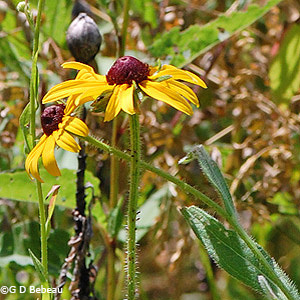 Black-eyed Susan (Rudbeckia hirta L.). Family: Aster. Upland Garden in various spots. A rough leaf and stem with hair. Native to prairie and open areas of Minnesota. Cultivars of this plant are readily available in the nursery trade. Common St. Johnswort (Hypericum perforatum L.). 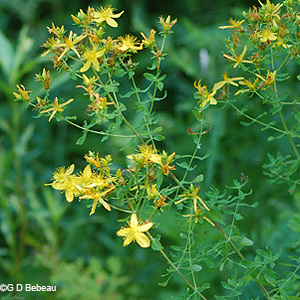 Family: St. Johnswort. Upland Garden in various spots. 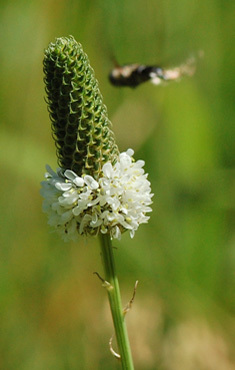 This plant of the common variety has the typical black spots on the petals. Originally from Europe, now common in the eastern part of Minnesota. Can be a noxious weed in certain areas. Whorled Loosestrife (Lysimachia quadrifolia L.). Family: Primrose. Upland Garden, growing in great numbers. 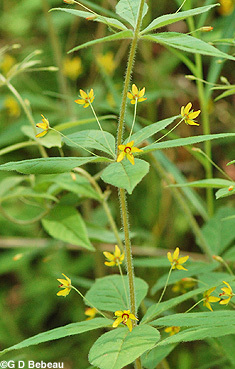 Flowers on long stalks springing from the leaf axils. Leaves in whorls of 4 or 5. 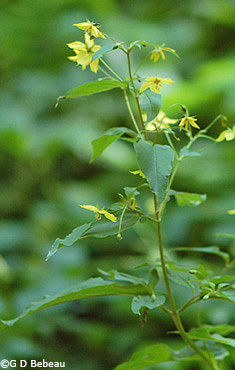 Fringed Loosestrife (Lysimachia ciliata L.). Family: Primrose. Woodland Garden. 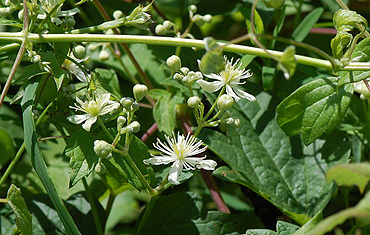 A shade plant, leaf stalks with fine fringes of hair, flowers somewhat nodding on long stalks from the leaf axils. Native to all of Minnesota. Bristly Bellflower (Campanula cervicaria L.) aka Bristly Bluebells. Family: Bluebell. Upland Garden in several places, but only a few plants. A European import to the Garden from the 1950s that has established itself. Winterberry (Ilex verticillata (L.) A. Gray). Family: Holly. aka Black Alder. Woodland Garden. A large shrub growing in the moist bog, forming red berries in the fall assuming that there are both male and female plants nearby as the sexes are separate. 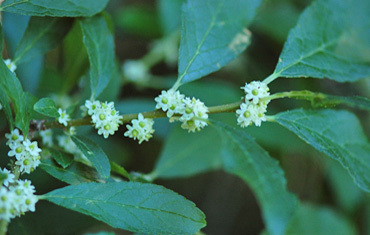 The small flowers form in the leaf axils. This is the only holly native to Minnesota. A favorite plant of former Gardener Ken Avery. 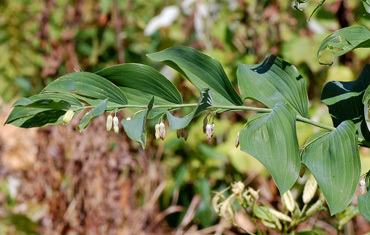 Great Solomon's Seal (Smooth Solomon's Seal) (Polygonatum biflorum (Walter) Elliott). Family: Lily. Dark blue berries will form from the hanging ivory flowers. Native to the southern half of Minnesota, can show up in your garden unexpectedly from deposited seeds. 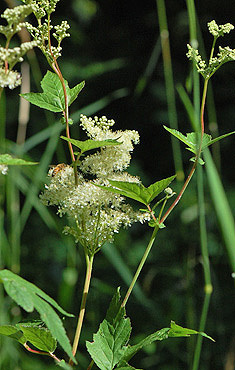 Queen of the Meadow (Filipendula ulmaria (L.) Maxim). Family: Rose. Woodland Garden. Growing in prolific numbers near the boardwalk, this herb is a native of Europe, from which salicylic acid (the basis of aspirin) was first obtained in 1835 from the flowers. 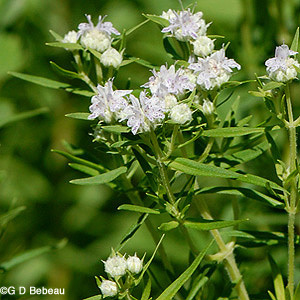 Note: The plant has various common names including Meadow Sweet and Bridewort. Likewise, other plants have been given this common name. 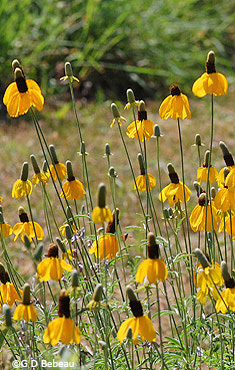 Long-headed Coneflower (Prairie Coneflower) (Ratibida columnifera (Nutt.) Woot. & Standl.). Family: Aster. Upland Garden. Native to western and southwestern Minnesota. Not as tall as the Gray-headed coneflower but with a taller center cone. Catching up with the group on a summer tour of the Garden.